Offering a measured balance between power and simplicity, TRACtion puts project execution at your focal point. For project leaders, TRACtion provides all the practical tools to plan and execute the project work. For executive program leaders, TRACtion offers the workflow management and visibility needed for oversight and reporting. Whether you have a Lean Six Sigma program or a custom approach to process improvement, TRACtion can be easily adapted to support your efforts. EngineRoom data analysis and problem-solving. 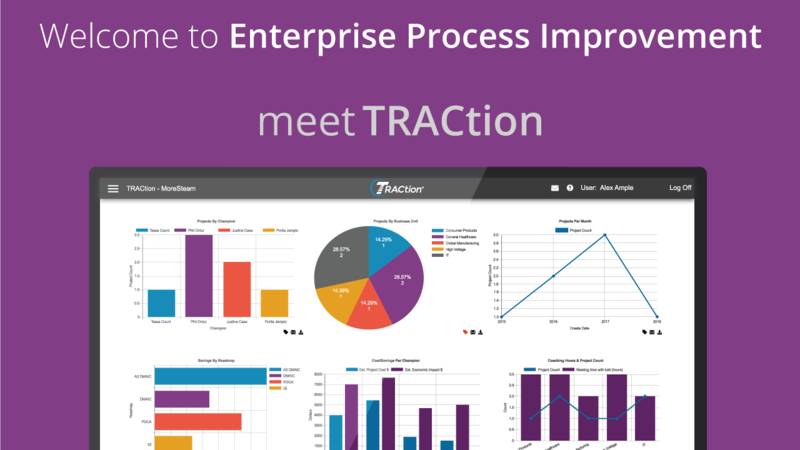 TRACtion is the only project management software with integrated data analysis, so uploading charts, graphs, and other analytical output into reports is no longer a constant irritant. TRACtion helps you to collect project ideas and then move seamlessly to project selection. Training and coaching support can be linked to the actual project work and real-time progress shared with all key stakeholders. Traction incorporates best practices for aligning project selection to your organization's strategy. Select the right projects in the first place by assuring projects target one or more Key Performance Indicators (KPIs). Make your projects' key metrics more visible and accessible by adding them to your TRACtion projects. TRACtion provides graphical summaries for a quick progress review and the ability to drill-down into the data tables. See how it handles KPI monitoring. Link project phases to MoreSteam’s world-class training to take “just-in-time” support to the next level. with tools, templates and tutorials for immediate access by end users. These process improvement resources allow project teams to forge ahead, keeping projects on-time and on budget. Project teams benefit from timely, customized coaching delivered at the point of need. Make the highest and best use of experienced lean practitioners and master black belts by exploiting the analytics and coaching tools TRACtion provides. TRACtion implements workflow rules and responsibilities to ensure phase completion and standardization. And, it makes the status of projects visible, bringing accountability to the process of process improvement. TRACtion highlights projects requiring intervention, increasing project success on-time and on budget. Share critical project information between project team members, Lean leaders and Lean Six Sigma champions, and process owners. Is a project successful if no one knows about it? TRACtion’s customized and automated reporting engine makes the question rhetorical. See how TRACtion’s reporting works.